Celebrating 2 years working with Gloucester City Safe! SSL Continue Their Fight Against Crime and Disorder in the City. SSL are celebrating the second anniversary of working with Gloucester City Safe to reduce crime, disorder and anti-social behaviour in the City. In March 2014, SSL were approached by City Safe and asked to help with the new scheme that was being launched to make Gloucester an even safer place for businesses and their staff, customers, local residents and the many thousands of visitors who come to the City every week. The Business Crime Reduction Partnership were employing a full time Co-ordinator, with initial funding from the Police and Crime Commissioner to set up and run the scheme and SSL were approached to see if they would help by providing IT support. The SSL team worked closely with the scheme Co-ordinator to identify their needs which included designing a brand new website, providing a computer with printer and setting up all the IT infrastructure. All this work was required before City Safe went live on 1st May 2014. Over the last two years, SSL have continued their close working relationship with City Safe and have been very valuable partners in making the scheme a success. Retired Police Chief Inspector, Rich Burge who is the City Safe Co-ordinator explains more about the partnership: "SSL have been absolutely brilliant from day one. We were really pleased with the design and launch of the website and without their IT support we really could not operate in the way we do. 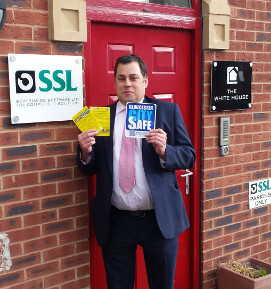 Gloucester City Safe has had a very successful first two years and our partnership with SSL has contributed significantly to that success. The Support Helpdesk has been invaluable and as soon as I get a problem with my Computer I ring them and they get the issue resolved." Gloucester City Safe recently expanded to Stroud and has 100 members from shops, pubs, clubs, restaurants, buses and a taxi company. One of their tactics is to issue a yellow card to those individuals who commit crime or act in a disorderly or anti-social manner in or near the member's premises. One yellow card is a warning but if an individual receives two yellow cards they can be excluded from the services and premises of all the members. To date 450 yellow cards have been issued but only 40 offenders have been silly enough to go on and get a second yellow card and get themselves excluded.